Here’s a neat looking infographic by Stephen J. Beard and Rich Exner from The Plain Dealer that I bookmarked a few months ago. 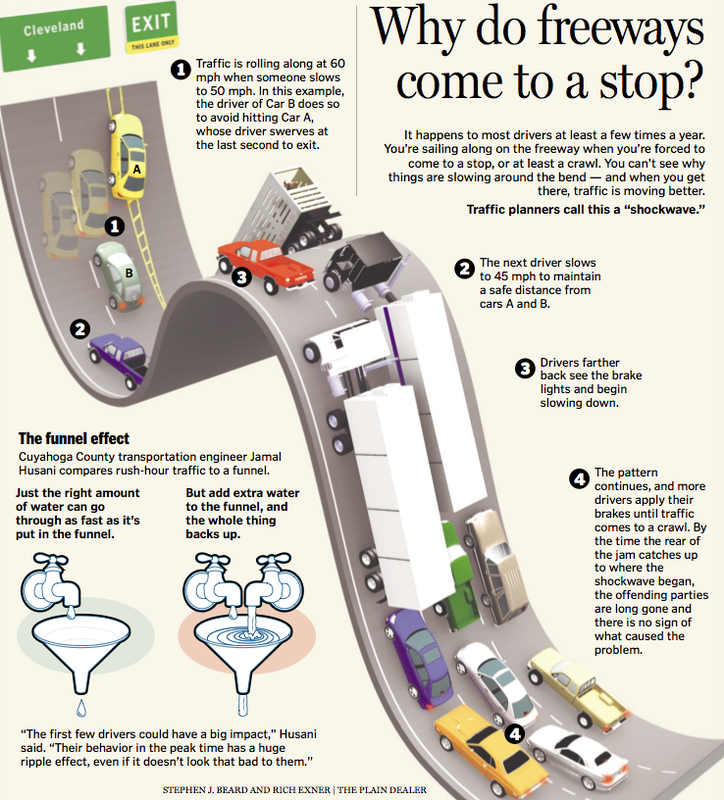 It addresses the question, why do freeways come to a stop? Seeing this graphic reminded me of how much I used to be fascinated by traffic when I was a child (even though I grew up in Rochester, NY, where traffic wasn’t often a problem). Here are a few scenarios I used to think about when I was on road trips with my family or just going to the store. Scenario 1. Suppose there was a multilane highway that is near maximum capacity, but everyone is traveling full speed. Then one driver puts his foot on the brake (maybe just taps it, maybe slams his foot on it). This causes the cars behind him put their brakes on. But, if one lane is slowing, the drivers in the neighboring lanes will probably also apply their brakes. Clearly the brake lights travel backward relative to the front car, which is moving forward. But how do the spreading brake lights travel with respect to the highway? How do the brake lights spread outward? If we had a theoretical highway with many many lanes and this braking driver was in the middle lane, what pattern would these brake lights make if viewed from above, and how would this pattern move in time? Scenario 3. We’ve all experienced the situation on a highway in which a 2-lanes go down to one lane. You and hundreds of other drivers are crawling toward the merge point. When you get past the merge point, the cars start moving faster. Pretty soon, you are driving at full speed down this single lane with generous space between the cars. How could this happen? Just for fun, let’s do a quick-and-dirty, back-of-the-envelope calculation to see why this last scenario can happen. Fact: the average length of a car is a little over 16 feet. Assumption 2: before the merge, there are two lanes of traffic, with cars spaced every 20 feet. How fast are the pre-merge cars moving? After the merge, 4 cars pass a given point every 3 seconds. Thus the same must be true before the merge. In particular, the pre-merge traffic would be moving approximately 13.3 ft/sec=9 mph. Here are a few cool traffic-related tidbits I found while searching the web. Breaking Up a Traffic Jam! As a postscript, here’s a non-mathematical traffic-related observation from later in my life. When I lived in Chicago (near Wrigley Field) I had to drive up to Evanston where I went to school. I could take Ashland Avenue (a 4-lane road) or Clark Street (a 2-lane road). Both routes were always full of traffic and very slow. Most drivers were irritated by Clark Street. There were always people trying turn left or parallel park. Drivers had to stop a lot—it was slow going. On Ashland there were many people turning left and parallel parking too, but with an extra lane the drivers could avoid them by changing lanes. The problem was, you never knew which lane would be faster. Often I’d change into the faster left lane, only to get stopped by someone turning or parallel parking. Even if I played things well and repeatedly chose the faster lanes, I’d probably only gain 100 yards on my original position for the entire trip. I didn’t get there much sooner, and the price of the time savings was a lot of anxiety. Eventually, I realized that Clark street was more relaxing for me. I just drove when I could, stopped when I had to, and never had to worry about changing lanes. I also realized that this is why I liked shopping at smaller grocery stores rather than the mega-supermarkets. It can be exhausting to make choices. The payoff of slightly lower prices and more variety isn’t worth the the effort required to make multiple decisions. I enjoyed your thoughts about traffic very much but I was not impressed by the graphic. It’s “a neat looking infographic” but there is no substance to the graphic; only the text provides significant information. It’s a pet peeve of mine seeing this explosion of gaudy 3-d illustrations that pose as useful graphics. A picture should be worth many words but increasingly graphics are simply eye-candy or worse actually mislead. Effective communication with graphics would be an interesting topic to address some time. Edward Tufte’s books are brilliant. Back on traffic. Is there a formula for deciding when to change lanes? Obviously when one lane is faster, people start switching to that lane which then slows down. A contrarian approach might work if one knew when to move out of the fast lane. Hmmm, sounds similar to stock trading.